When we finish something, it really isn’t the end of what we hoped for. Actually it is more often than not, the beginning. When I built our dinner table almost 23 years ago, I was excited about getting it done. All of the planning, the careful work, the cutting, sanding, and varnishing… all of that would have been for naught if I finished and then set it on fire, unless a very time consuming and costly bonfire was what I was hoping for all along. Rather, I spent all of that time making the thing so that it would be ready as a present for my wife. And then, once that was out of the way – I mean the hauling it into the house, placing it there while she was out, anticipating the look on her face, and all of the other things that go along with giving a present like that to someone – I mean once that was out of the way, then there would be another reason for having built the table. Right? It was in hopes of using it for many years as a place where we could eat, sneak bits off the table for one of the dogs, place flowers, pay bills (hate paying bills! ), watch TV, and on and on. And so, finishing the table was really only the starting of what the work was intended for. As I said, the same is true with with most things. We finish school in order to be edumacated enough to get a job, or to get accepted into another school. And when we finish our job we retire, so that we can do the things that we couldn’t do when we worked. God began a project too. All along it was intended as something that would be eternal, but in order for that to be the case, there had to be something to bring it about. He knew before He ever created, that if man was involved, death would also be involved. But death implies an end, whereas eternity means that which is endless. If death was involved it was because there was something imperfect which brought that death about. That imperfection is known as “sin.” In order for sin to be eradicated, and for the imperfection to be removed, then there must be a process which is followed, a process which would involve another death. The difference is that this death would have to be a perfect one, not involving sin in the One who dies. God knew this, and His word calls Jesus “the Lamb slain from the foundation of the world.” This is the project that God started, and this is the project which He finished through the work of Jesus Christ. But the finishing of the project was only meant as a new beginning, not the end. Like the table that has another purpose than just being made into a table, the work of Jesus Christ which ended with the words “It is finished” had an entirely different purpose behind it. It is a purpose which involves any and all who are willing to receive it by faith, and it is one which will last… yes, for all eternity. This is what we will see in today’s resurrection day sermon, and it is a truth which is found in God’s superior word. And so let’s turn to that precious word once again and… May God speak to us through His word today and may His glorious name ever be praised. Genesis Chapter 1 gives us a broad brushstroke of creation, explaining in one chapter the order of what occurred, and the totality of God’s creative effort. In other words, in just 31 verses, the Bible tells us that everything which we see in the universe around us came into existence by the wisdom and power of God. And yet, the focus of all of this vast, marvelous creation is centered on one particular thing – the creation of man. How do we know this? Well, first, the Bible is written. Writing is information in a specific form and for a specific purpose. Inanimate objects don’t need or use writing, man does. Writing isn’t used by any animate objects apart from man either. The fact that the Bible exists shows us that what is presented in it is intended for man’s use. Without man, there would be no need for a description of how creation occurred, and thus no need for a Bible. Secondly, and with that first understanding as a key to everything that will follow in all of this book we call “the Bible,” there is a specific attention given to man in the 1st Chapter of Genesis. In the creation of the physical universe, the earth where we live is specially highlighted. Those two words describe everything else that exists in the physical universe, but only those stars that are visible to man are considered as important enough to even mention. We know this, because elsewhere in Scripture, constellations are mentioned by name. A constellation is only useful from one vantage point. Any other planet at any other point in the universe will see the stars differently, and those constellations will not exist as we know them. Further, by calling the sun, which is also a star, “the sun,” it means that this particular star is one prepared specifically for the earth on which we live, an earth which is specifically made for man who was to be created on it. And so we again see the importance of man highlighted implicitly through this detail. And thirdly, as each day of creation is noted, it builds upon the previous days in order to reach a result. God carefully and methodically created with an intent and purpose, which is to provide a place where man could dwell. Everything else was created for this purpose. The room was prepared and the guests were expected. Man bears a special garment that distinguishes him from all else in creation, He bears the image and likeness of God. It is to this image-bearer of the Creator that dominion of the earth was given. And then there is a fifth way of knowing that man is the central purpose of God’s creation. It is because Chapters 2 and 3 of Genesis insert the many details of man’s creation and early moments which Genesis 1 left out. It is given to show specifically that the Bible is intended for man’s knowledge of who he is in relation to his Creator, and how he arrived at the place that he is now, and that the Bible is the record of these things. After Chapter 3, the narrative continues on in this way for the next 1186 chapters, right up until the the last page, and indeed until the last word of the book of Revelation. And so, understanding this, and as our first thought today is “It has Begun,” we want to discern what, in fact, has begun. There was an innocence about them which was, according to the word, “very good.” In this state of innocence, they were set to have a wonderful existence which would keep them ever in the presence of the Lord, and forever free from pains, trials, or sadness. But this marvelous existence would not last very long. Indeed, it would slip away from them just as the breath itself disappears as it is exhaled on a cold morning. Without wasting any words, Chapter 3 immediately introduces the serpent, the cunning deceiver, who would bring an end to the innocence of man and the intimate fellowship that he enjoyed with the Lord. In a mere 24 verses, Chapter 3 takes the man from a state of innocence to a state of understanding. It takes him from a state of life, to a state of death. It takes him from being in a paradise of abundance, to expulsion and exile to a place of hardship and toil. And, worst of all, it takes him from intimate fellowship with the Lord, to a state of enmity with Him. The man became like his Creator in that he acquired the ability to know good and evil. But without the ability to properly use that knowledge, it is as much of a curse as it is a blessing. It may be good to know how to cut down a tree in order to build a house, but if we cut down too many trees, we might cause a mudslide which could come down upon the house we have built. Each thing that we do may have unintended consequences, and so without knowing the end from the beginning, what is good in one instance may be bad in another. Until we learn from our mistakes, we often remain ignorant about what is truly good and what isn’t. Unless we have external guidance from one who has already learned, or from the One who knows all things, we are prone to err. And when we err, evil is more often than not the result. But this is how it began. The life we live, the troubles we face, the lack of fellowship with God that we experience, all of it began because we didn’t do what He asked of us in the first place. From that point, we were set on a course that we could not fix, and which leaves us wandering aimlessly through one mistake after another. And this continues on until we lay our head down for the last time and return to the earth from which we came. Truly, it is a vain and hopeless existence when we don’t have all of the information we need to make the right choices. Who will it be, how will it come about? The end of Chapter 3 of Genesis, and all of the misery of the world since then, should really make us wonder if going on is even worth the trouble. Why bother when all we will get is older, more feeble, less respect, and just aching bones and sleepless nights. This would be the case if we didn’t pay attention to the details of Chapter 3. A promise was made that the cunning deceiver would be defeated, and when this was accomplished, man would have access once again to the paradise he had lost. How do we know this is a correct reading of those words? Because it is implicitly stated from this point on. In a thousand different ways, the people of faith understood this, and the Bible records that their interpretation of it is correct. Restoration would come, and it would come when the Seed of the woman arrived. From this point on, from Chapter 4 of Genesis on, the story of this coming Redeemer takes shape. A select line of people are highlighted, and with each new page, the story continues to unfold. The select line are known as bene ha’elohim, or “sons of the God.” Those not in this line belong to ha’adam, or “the man.” The distinction between the two comes down to what their life was directed to. Were they people of faith in the promise of God, or were they men who followed in their first father’s footsteps, trusting in the deceit of the deceiver? Eventually, it came down to a single man named Noah. The entire world had followed after the serpent, and God determined to put an end to what He saw. However, He had made a promise, and so he spared Noah and his family in order to keep the promise alive. God is ever-faithful to His word. In the destruction of the world, Noah was kept safe and together with his family, they arrived on the shore of a new world, one ready once again to allow man to flourish and live out his days, exercising his will in hope or in futility – the choice was his. And once again, in the mere turning of a page, there is rebellion and there is the pronouncement of a curse. It seems that man is destined to self-ruin. But in the midst of the disobedient heart, God continues to work out His plan, carefully and methodically. With the turning of one person or group, there is the calling of another. But, it can’t be said that one is better or more deserving than the other. Eventually from Noah’s son Shem, one of his descendants named Abraham was called, but he was called from one life to another. We read in Joshua that Abraham’s family served other gods, not the true God. His calling was an act of grace. They were called out of this state. Therefore, it was a call of grace, and it was a call of mercy. The call was not from righteousness to righteousness, but from disobedience to righteousness. God had a plan, it was set, and he was working it out according to His wisdom. Each step is carefully recorded for us to see and to understand that we had not been abandoned, but were still the central focus of His act of creation, just as it was at the beginning. To Abraham, a promise was made, a great and marvelous promise, one that would be realized in and through his descendants, but as time drew on, it became harder and harder to see how it could come about. His wife was barren and under the normal conditions of life, it would seem that things would not turn out as they were expected to. But Abraham believed God and remained faithful despite the barren years. In believing the unbelievable, and in trusting what seemed impossible, the Lord credited Abraham with righteousness. The Lord is pleased when His word is accepted at face value and believed as true. Eventually, Abraham did have a son, a son of promise named Isaac. From Isaac came another son of promise, Jacob, who is Israel. And from Jacob came a collection of sons, all were granted the promise of Abraham. Collectively, they would be known by the name given to their father, Israel. It is this unique and set-apart family who would continue the marvelous march towards the fulfillment of God’s plan. The resolution of the problem would come through them. Their history is chronicled, and each step of the way, God’s guiding hand is seen often in the foreground, and it is never lacking in the background, directing their affairs towards an ultimate goal. Certainly, they had no idea what lay ahead, but we can look back on their history and see it with such clarity that it is really astonishing to consider. Seemingly random events come together to form the most marvelous tapestry as the years of Israel unfolded before them. Finally, when the time was right, God began to use them to display His glory in the world. The stories of their redemption from Egypt, their passing through the waters of the Red Sea, and the marvelous events which led them to the foot of Mount Sinai would be counted as mere fairy tales unless we knew that God was behind them. But He was, and the stories are recorded so that we can be assured that Israel’s history is not an aberration, but a carefully sculpted plan with a definite and marvelous purpose. There at the foot of Sinai, the Lord gave them His law, He gave them His instructions for a place where He would dwell among them. He also gave them ordinances for how they could approach Him, and how they were to conduct their lives in His presence. To live is to not die. The promise is clear. If a man does these things, he will live by them. The life that was lost in Adam could be obtained once again through this marvelous law which the Lord set before the people. Life, not death, was possible. The resolution to the problem was now available. In being obedient to the Lord’s word, life – yes, certainly eternal life – could be obtained. This is what the word says, and this is in fact the word of the Lord. Oh! That Christ would die for sinners like us! How deep is the love of God for this to have come about? Christ died and into the grave He went – had death won? He burst forth from the grave in radiant glory! With the giving of the law, everything that was lost could be restored. At least that’s the way it appeared on the surface. But by digging deeper into what the law was showing us, it became evident that there was a problem. It was the same problem that has been seen since the very beginning, and that problem is sin. The law made the promise that the one who did the things of the law could live by them, but what was evident right away, and what continued to be more evident with each passing year, was that nobody could do the things of the law. Instead of bringing life, it only brought death! The argument goes like this: If there is no law, then there can be no violation of the law. In fact, a person wouldn’t know what something like coveting was without being told to not covet. But as soon as the law is given, sin then takes the opportunity through the commandment to produce the desire to covet. Without a law, there is life, but when a commandment is given which is supposed to give life, it instead brings death. Sin uses the commandment to deceive, and through that comes death. This is the dilemma of the law. If a man does the things of the law, he will live by them, but in the giving of the law, sin is stirred up and he dies by that same law. And what is more, even the very mediator of the law was exposed to this truth. He had the knowledge of good and evil, but sin used that knowledge to bring him death, not life. The record of this truth stands in the eventual death of Moses, of Aaron, and of every other person who ever lived under this law – high priest or layman alike. The law which promised life, did not deliver it. Instead, it continued to produce death. Was there nothing that could free them from this body of death, which indeed it was, a body of death? The people of God, selected from among the nations of the world, given great and enduring promises, and among whom dwelt the Lord God, and who were sanctified by His presence, could not obtain the life they sought through the law they were given, despite that law being right there with them, and which was intended to guide them. And if they, chosen and set apart, could not obtain life, then how could anyone else, not even of their line, hope to find it? What was the answer? What is the answer? To where do we turn in order to find life? Or, is it all futility ending in death? If so, why delay the inevitable? But have we forgotten the promise? Have we become so consumed with our own works that we have failed to remember what the Lord said to the deceiver? The Lord promised that the serpent’s head would be crushed, but it wouldn’t be one of us who would do it. Instead, it would be the Seed of the woman. What that means was long misunderstood. Eve thought it was speaking of herself. When she had Cain, she cried out, “I have acquired a man from the Lord.” She thought that she had a child that would handle the problem and restore her to paradise. She even claimed that the child was “from the Lord,” as if in a resounding cry of victory. However, it wasn’t long before she realized she was wrong. With the birth of her son Abel, there was no cry of victory. When she named him, it was with a sense of despair. Life was a passing breath, and Abel reflected that futility to her. With the continued line of people from Eve, there is often the talk of the seed which would continue on. The daughters of Lot wanted to preserve their father’s seed, intending to find life through it. David was promised that his seed, One who would come from his body, would build a house for the Lord and would establish the throne of his kingdom forever. This theme is repeated numerous times, showing that the seed of the man was needed to bring in the eternal promise, but that promise still needed to be fulfilled in the Seed of the woman as well. It is rather confusing to consider when looking forward. However, we today are not looking forward. We are looking back, and the picture is clear. The failures of Israel were each a lesson, and also a stepping stone, to the success of God. The law promised life to one who would do the things of the law, but the nature of man made it impossible for him to do the things of the law. And so God handled the problem for man, by becoming a Man. In order to do this, the Holy Spirit of God, the third member of the Trinity, overshadowed a virgin woman of Israel. She, being a descendant of those to whom the promises were made, was to be the human receptacle for the incarnate Word of God. It was He whose coming had been promised for 4000 years. The prophets spoke of Him, and the Lord testified through them in His word the things that He would accomplish, and the glory that would be revealed through Him. As we are told by John, “And the Word became flesh and dwelt among us, and we beheld His glory, the glory as of the only begotten of the Father, full of grace and truth” (John 1:14). In being born of a woman, but not of a man, He was truly and fully man, but also truly and fully God. But in this state, He was born as a Man without sin. As sin is passed from father to child, and as all humans are born of both a father and a mother, all humans inherit sin. However, as He was born of a woman, but not of a man, He inherited no sin. His father being God meant that He was born in a state of sinlessness. He is a Man, is He not? Yes, He is a Son of Adam through Mary. And He has the ability to keep the statutes and judgments of the Lord, does He not? Yes, being the Lord God incarnate, He was fully capable of accomplishing this. In doing the things of the law, life would thus be the result. This is why the gospel writers give such minute detail concerning the life of Jesus. They were chronicling the marvel of this Person who came and dwelt among them, showing us that He was qualified and capable of the task, and also showing us that He, in fact, performed what He was called to do. Each step of the way, His obedience to the law, and to His Father, is carefully recorded. But this record isn’t for Him to revel in, it is for us to believe in. The Lord doesn’t need the word to be the Lord, or to accomplish His task. But man needs the word to understand the work of the Lord in accord with the word. And so the word is given. And then He said something that truly revealed what He had come to do. In the very next verse, He said, “But you are not willing to come to Me that you may have life” (John 5:40). In coming to Him, they could have life. The life promised in Leviticus 18:5 was to be found… in Him! This is what the gospel writers recorded, and this is what they testify to. The fulfillment of the Scriptures is found in Jesus. And in fulfilling them, life was to be found as well. He told the leaders of Israel this, but they couldn’t grasp it. They couldn’t believe. The very people who maintained the oracles of God, failed to accept the truth of God contained in those oracles. However, their unbelief in no way nullified the faithfulness of God. He spoke, He accomplished, and His word stands as a testimony of what He alone has done. And so, in being born sinless into the people bound to the law, in living without sin under the law, and in His death without sin, He thus died in fulfillment of the law. The One who was promised at the very beginning, willingly came, voluntarily surrendered Himself, and allowed the beings that He created to take His life so that they could live. Tell me that isn’t incredible! Each of the four gospels details the crucifixion of Jesus Christ. Each gives details from the writer’s own perspective, and they record the scene in their own words while highlighting what they were inspired to write. 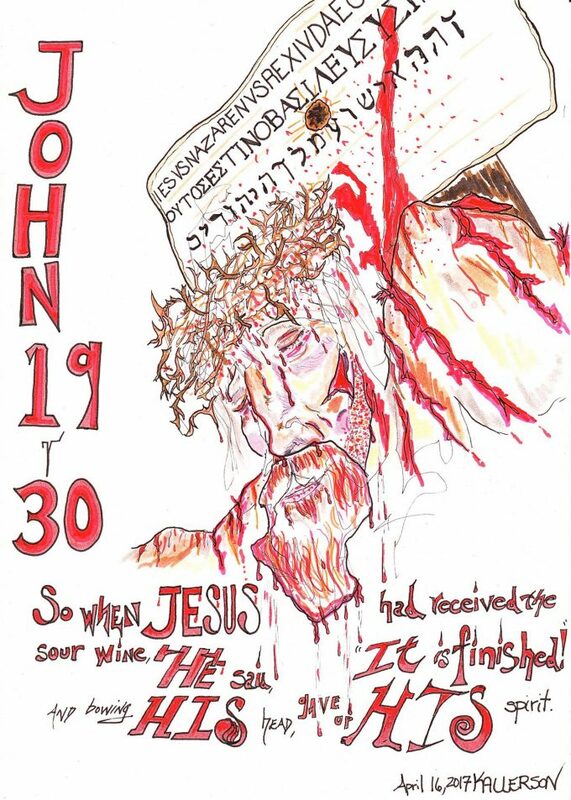 The gospel of John records the crucifixion in the19th Chapter of his book. John notes that Jesus knew that all things were accomplished, using the word tetelestai. The word is the perfect tense of the word teleó, or “fulfilled.” John then says that in knowing that all was perfectly fulfilled that Jesus said, “I thirst” in order that Scripture might be teleiōthē, or fulfilled. It is the aorist tense of the word teleioó. It indicates working through the entire process in order to reach the final phase. If one thinks of pulling out a pirate’s telescope one stage at a time until it is fully stretched and at maximum capacity, this is the idea of what John was saying. It then notes after Jesus received the sour wine that He said His final words, tetelestai, or “It is finished.” It is the same word as at the first, teleó, and it is again in the perfect tense. It is finished – completely and wholly. It is done. What is being said, is that Jesus had come and fulfilled every single thing necessary to undo the work of the devil. He had fulfilled every requirement of the law, He had taken the full weight and measure of God’s wrath in fulfillment of violations of the law, and He had thus prevailed over the law, not merely in and of Himself, but for any and all who would accept what He had done. The word teleó signifies a payment. This is why the word is translated as “finished.” When a debt is paid, the payment is fulfilled. The law of God demanded a payment for violations of that law. Adam broke the law, though it was but one law and in the negative – “You shall not.” Because of this, a payment was due. The people of Israel violated God’s law, time and time again, but just one infraction of the law broke the entire law. And thus a payment for violating the law was due. In Christ’s fulfillment of the law through His death, the payment was made. But unlike the sin offerings which were prescribed under the law which could not take away sin, Christ’s payment could. The animals which were sacrificed under the law only looked forward to a more perfect Sacrifice. They temporarily stayed the wrath of God that only Christ could perfectly and eternally take away. Jesus knew the point when His work had fulfilled the law, and so John notes that He then said, “I thirst” so that Scripture could be fulfilled. The fulfillment of the payment is what Jesus understood was completed, and the thirsting of the Lord for His God is what He desired. When one drinks, it is to prolong life, but in Jesus’ case, it was to show that despite taking that which could prolong His life, He still voluntarily gave it up. It was not taken from Him, instead He yielded it of His own will because of His thirst for His God. The redemption of man had come, and the payment was complete. But in understanding that, we still must have a final explanation of what this means. The law says that the man who does the things of the law shall live by them. It is a promise. But we have also seen that none can meet the demands of the law. And so what does Christ’s life and death mean to us? It goes back to the doctrine of substitution. Christ died, as the animals at the temple died, as a Substitute. In His death, we can have our sin transferred to Him. As substitution was a part of the law, and as He fulfilled the law, then He must be an acceptable Substitute for any who desire His death in their place. In that death, sin is atoned for. And as He died in fulfillment of the law, then to God we die with Him in the transfer of our sin. Through the law we thus die to the law, and we move from Adam to Him. As we die to the law, then the law no longer has mastery over us. And as the law is what brings death, then death itself no longer has mastery over us. The deceiver can no longer deceive. The devil is defeated, and death is swallowed up in victory! How do we know that this is true? It is the reason we’re here today. Christ didn’t just die for our sins and stay in the grave. No! Instead, He defeated death itself because He had no sin of His own. Death is the result of sin, and life is the result of obedience to God’s law, and so death could not hold Him. And as we are in Him, being counted as justified before the law, death can no longer hold us. The death and resurrection of Jesus Christ is defining moment of human history. For those who receive what He has done, there is but one outcome, that we too will be resurrected unto eternal life, and we too will be restored to the paradise which was lost to man so long ago. I hope that today you will take time to read the final two chapters of the book of Revelation. For any and all who will but come, Jesus Christ has shown us in His word the glories which lie ahead for us. If you have never received Him as your Lord, asking Him to forgive you and grant you eternal life, today is the day. Don’t wait another moment, but simply call out, and He will lead you back home to where we were originally intended to be.